Fiber Artist’s Bag of Candy! This fun sampler contains 60 different colors of wool! Spinning your own yarn for knitting, weaving, or crocheting is immensely satisfying, and expands your creativity options. Read our free tutorial and learn how you can spin, too! 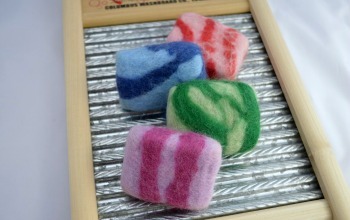 What is felted soap? It’s a soap and a washcloth all in one, and our easy-to-follow directions will walk you through the process of creating your own! Andean plying is used to create a two-ply yarn from one source of singles. Our easy to understand diagram will get you going in no time. The purpose of carding fiber is to open the fibers and get them in a manageable bundle so they can easily be drafted when spinning. Click on the image above for a tutorial. Here’s how we wash wool – click above to read more. Bobbin lead (pronounced “led”) is a drive system where the bobbin is “leading” the flyer. Click on the image above to read more.